I don’t belt often as I’m an H shape and have a short waist with large bust, so belting at the waist draws attention to my boxy shape and makes my breasts look larger. But occasionally I do like the addition of a belt as it adds a detail to my outfit to make it more interesting. Adding a belt can give a little more interest and detail to an outfit. Belts are great for those with defined waists (8s, As and Xs), they create a waist on the slim I shapes, but are harder to wear by those with undefined waists (Hs, Vs and Os). 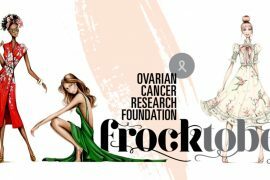 You can belt over a dress, cardigan or jacket. A self-coloured belt will draw less attention to your waist than a contrasting belt. 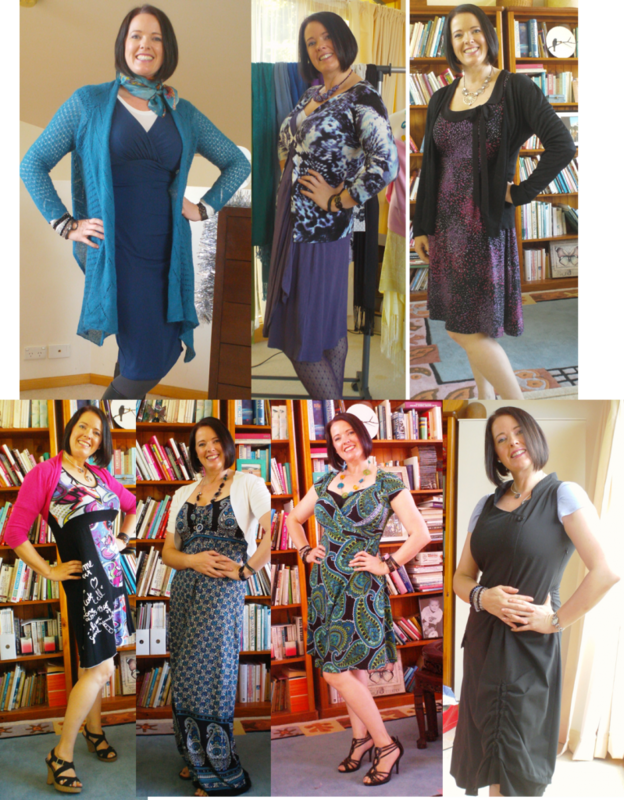 Belting under your jacket or cardigan will create the illusion of a waist for those who lack them. A hip belt works better for Hs and Vs than a waist belt. Hs, Os and Vs can also all belt to the back (tie a belt on a trench or cardigan to the back rather than the front of the garment. Belt at your empire point rather than your waist or hip also can work for Os and Hs. Matching belts, bags and shoes? And see how a simple belt can add that little difference to an otherwise plain outfit as Nicole Avery of Planning with Kids experimented with accessories. Fantastic summary. I’ve attempted to demonstrate in my blog that sometimes a wider belt can work on an 8 with a short waist, right now I have a noticeable shelf despite being generally slim, but the outfit with the wide black belt on my blog I can just about get away with, I feel. As opposed to an X, on whom the fat is always more evenly distributed, an 8 really does concentrate her flab on the high hip and lower abs and then bum (but not really much or at all on lower hip or thighs) (This is my experience of when I was 5 kilos heavier than now). 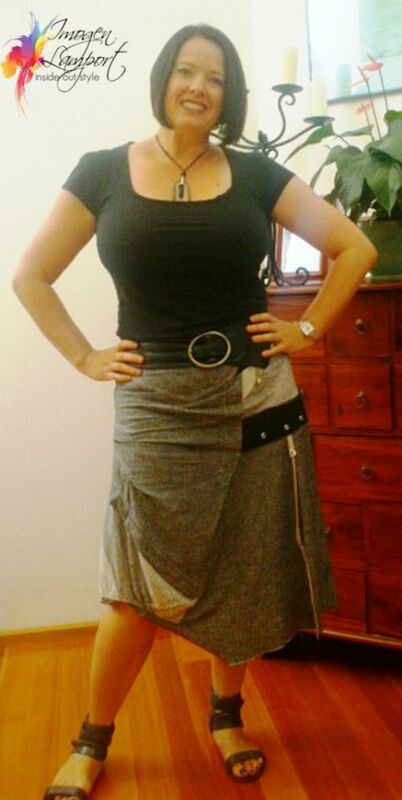 There was also once a time when I was 6 kilos less than I am now and then clothes that are meant for an X rather than an 8 (such as skirt or dresses with more of a flare or wide belts) looked fine on me. The bone structure of me as an 8 as opposed to an X will always be different but perhaps the tendency on where one’s body concentrates the flab is even more important. Both an 8 and an X share the fundamentals of narrow waist-wider hips, which will always be key to how to best dress these shapes, but when very thin with no flab, the distinction is much less pronounced I’ve found. Susie – you may turn from an 8 to more of an X when you gain weight (depends where you deposit the fat first!). 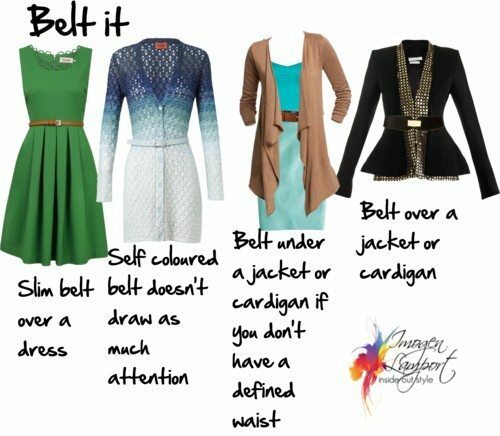 Love the wide belt over the cardigan as well as the slim belts with your straight skirts! Belting is a bit of an essential requirement for me, at times, otherwise I would look like a box. 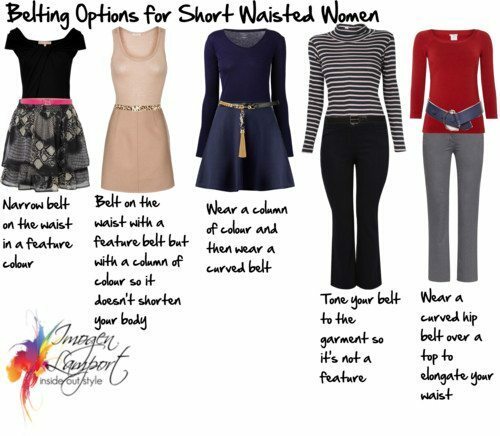 I’ll often wear a waist belt but am also fond of a wide belt around my hips. That is a gorgeous skirt Imogen. Where did you get it?? In recent years I’ve tended to avoid belts, however I’m not one to turn down a challenge! First I tried a belt over my sweater (NOT a good look for me!) then I wore a waistcoat over the sweater and belt, which I decided would be acceptable. PS I am now looking to see if I have any suitable sparkle for Saturday, lace (I think I ditched the lace when I moved to Spain five years ago!) and animal print. I wore a belt, but didn’t get a chance to post it yesterday, so here it is, a day late! I liked this combo a lot. How should it be improved? Good Morning from Canada: My comments refer to your picture in the black top and belt. Although I think your upper half looks great, I’m not in favor of your skirt or shoes which don’t do anything to enhance your figure. Shoes with ankle straps always make legs look shorter and the skirt (what on earth is going on there ?) takes the eye away from the lovely look of your top half. I’m all for being creative witih ones outfit but not at the expense of understated elegance. 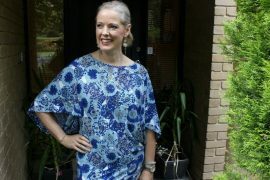 One of the things I love about style is that there isn’t a one size fits all approach. I have a more creative dressing style than you by the sounds of it, which is why you don’t like my skirt, it’s all about deconstruction, which those who are more classic dislike. And yes I know that ankle straps shorten legs, but the thing is, sometimes I don’t care, because style is also about not just following all the rules (which I know) but also about breaking them and expressing your personality.